The sample policy below can be used as a guideline when it comes to mandating the wearing of the mourning band within your department. The mourning band is very symbolic in law enforcement and should be worn with great respect and under department guidelines. Inappropriate usage could devalue its meaning. It is our hope that these guidelines will help agencies answer questions on when to wear while keeping the traditions in wearing the mourning band in high regard. The preferred mourning band is a solid black band that will fit tightly around your agency's badge. 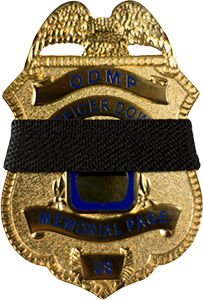 For most badges, the mourning band should be worn straight across the center of the badge. For star badges, the mourning band should be worn from 11 to 5, as if looking at the face of a clock. The width of the black band should not exceed ½ inch. Mourning bands with the thin blue line are not preferred, although some agencies use them. Upon the line of duty death of an active law enforcement officer (LEO) in your department. The mourning band should be worn for a period of thirty days from the date of death. By all LEO in uniform or in civilian clothing while displaying a badge when attending the funeral of an active LEO. Upon the completion of the funeral, the mourning band shall be removed. Upon the line of duty death of a LEO from a neighboring jurisdiction. The mourning band will be worn from the date of death and removed at the conclusion of the day of burial. The day of any memorial service your agency has honoring your department's LEO's who have died in the line of duty. At the direction of your sheriff, agency director or chief of police, when special circumstances dictate that a department display of official mourning is appropriate. It is also appropriate to stripe the badge(s) on your agency's vehicles, if one is displayed, for a line of duty death. Black ½ inch electrical tape or black ½ magnets could be used. Preferred striping is from left to right on the badge and go from 1100 to 1700 hours using a clock as a reference. A straight black line through the middle of the badge is also appropriate. This mourning band protocol was developed by Lieutenant (Retired) Ken Baine, during his time as commander of the Fairfax County (Virginia) Police Department Honor Guard.